As an analytical company and concerned as we all are about losing a large percentage of subscribers by having to comply with the GDPR, we wanted to analyze what statistics exist in the market about the opening and clicking of newsletters in all sectors. 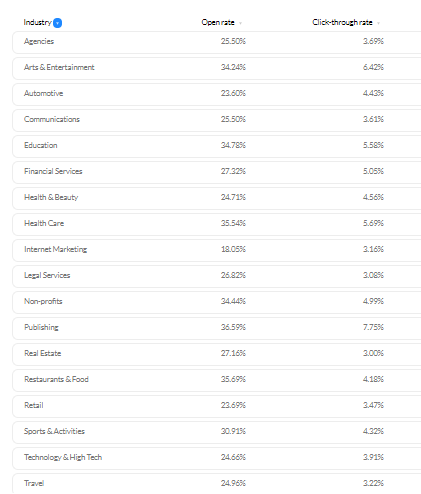 If we take into account the open rate of emails, the most favoured sector is publishing with 36.59% followed by restaurants & food (35.69%) and health care (35.54%). However, if we take into account the percentage of campaigns that register (at least) one click through rate, we see that the numbers are reduced considerably. Thus, with 7.75% click-through rate, the publishing sector once again tops the list, followed by arts & entertainment with 6.42%. The highest percentage of opening is obtained by large companies, with more than 50 employees, with 22.83%, while the highest percentage is registered by small companies (with a maximum of 10 employees). If we focus on the geographical location and the case of Europe, the opening rate in this continent is 29% and the click rate is 5.06%. On the other hand, on all continents the open rate is 24.88% and there is a click-through rate of 4.06%. More specifically, in the case of Spain, the opening and click rates of newsletters are slightly above the European and world rates with 30.44% open rate and 4.08% click-through rate. When talking about email marketing and newsletters, we cannot ignore the growing importance of mobile also in this field. According to the following graph with data from 2017 provided by Litmus, mobile devices are the most used to consult emails, with more than half of the market share until July 2017. 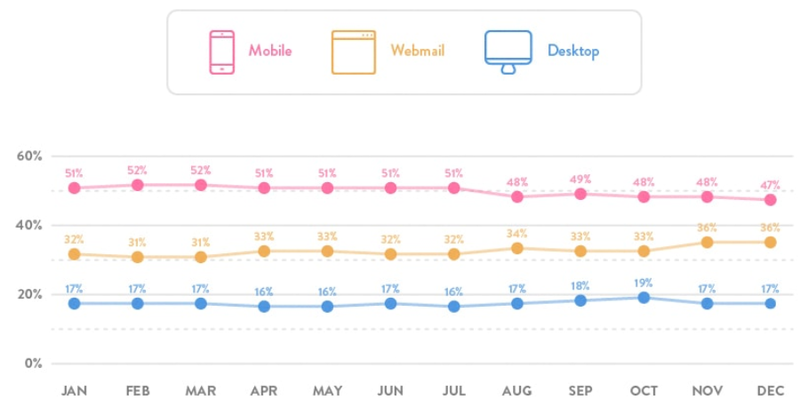 Subsequent to this month, mobile lost some relevance and, on the contrary, webmail increased slightly to reach 36% in December 2017. To finish with the data on newsletters and in relation to the days of the week in which the open and click-through ratios are higher, Friday is the day when the highest percentages are registered with 23.6% open rate and 3.5% click-through rate. And what does RGPD mean for email marketing and newsletters? The figures tell us that, in Europe, only 29% will open confirmation emails and only 5% will click. If we also add that in some cases it is necessary to add data or select boxes, and the current bombing in this final sprint, we predict a drastic reduction in the volume of newsletters traveling through the networks as if it were an exercise in cleaning pipes, or better, in eliminating the old ones and creating new ones, which are sanitised. And of course, it’s our turn. If you want to continue receiving contents like this one click here and we promise not to exceed a monthly communication. Otherwise, it’s been a pleasure, we’ll listen to each other on Social Media.